The origins of Polish universities of technology go back to the XVIIIth century. They were related to either military technology or mining, which demanded complicated technological processes as a result of the exploitation of deeper seams. The model school of technology, a university of technology, was designed by the French, who in 1794 founded the School of Technology in Paris. In the beginning of the XIXth century universities of technology were opened in Prague (in 1806), Vienna (1815) and in Karlsruhe (1824). In Poland, the first multidisciplinary university of technology was the Preparatory School for the Institute of Technology, which was opened on 4th January 1826. The Warsaw University of Technology still cultivates its traditions. The man who played the most important part in creating the school and writing its syllabus was Stanisław Staszic. Kajetan Garbiński, a mathematician and Warsaw University professor became the director of the school. The School was closed in 1831, after November Insurrection, and it was re-born as the Emperor Nicolas II University of Technology only in 1898, when the Technological Section of the Warsaw Society for Russian Commerce and Industry, whose director was engineer Kazimierz Obrębowicz, collected funds for the opening of the University. Classes, with Russian as the language of instruction, started on 5th September in the building at 81 Marszałkowska Street. They were soon moved to new buildings, built especially for the Institute. They were designed by Bronisław Rogóyski and Stefan Szyller. On the day of the opening, the University had three faculties: the Faculty of Mathematics, Chemistry and Engineering and Construction. In June 1902 the Faculty of Mining was opened. Poles constituted the majority of students until 1905, when their number reached 1100. At the same time Warsaw, when German troops had entered on 5th August 1915, the new occupants, who wanted to gain the sympathy of Poles, allowed the Warsaw University and the Warsaw University of Technology to open with Polish as the language of instruction. The grand opening of both universities was held on 15th November 1915. Zygmunt Straszewicz was the first rector of Warsaw University of Technology. The period of World War I, together with the events connected with the restitution of the Polish State and the Polish-Bolshevik war did not help the development of the school. Daily lectures at the university only started in November 1920. The school taught the young future engineers at several faculties: at the Faculty of Mechanics, Electrical Engineering, Chemistry, Architecture, Civil Engineering, Aquatic Engineering, and finally, at the Faculty of Geodesy (or since 1925 - of Measuring). The last three faculties were merged on the basis of the new Academic Schools Law of 15th March 1933. The Polish Cabinet issued a decree on 25th September 1933 in which the new Faculty of Engineering was created. The general number of the Warsaw University of Technology students in the period of twenty years between the wars grew from 2540 in the 1918/1819 academic year to 4673 just before the outbreak of the World War II. In the same period the school granted more than 6200 diplomas, including 320 for women. The Warsaw University of Technology became the most important scientific centre of engineering in Poland and gained international prestige. At that time, 66 people were given PhD titles, and 50 qualified as assistant professors. The University was the centre of scientific research for people whose achievements were fundamental for world science and technology. The names include Karol Adamiecki, Stefan Bryła, Jan Czochralski, Maksymilian T. Huber, Janusz Groszkowski, Mieczysław Wolfke and many others. In the period of World War II, despite enormous material losses and repressive measures, the Warsaw University of Technology operated the underground. Teaching continued in the form of clandestine and open courses, in vocational schools and from 1942, in a two-year State Higher Technical School. Circa 3000 students took part in the clandestine courses and 198 got their engineer diplomas. Scientific research was also conducted, as 20 PhD and 14 assistant-professorship qualifying theses were written. There were also many works that were to serve the reconstruction of Poland after the war and constitute the foundation for the development of science in the future. Students and professors clandestinely worked on various projects. Professors Janusz Groszkowski, Marceli Struszyński and Józef Zawadzki conducted a detailed analysis of the radio and steering devices of the German V-2 missiles, which was done at the request of the Polish Home Army Intelligence. After German troops had been dislodged from Warsaw, classes started in improvised conditions on 22nd January 1945, and by the end of the year all the pre-war faculties were re-opened. Old, demolished buildings were rebuilt quickly and new ones were erected. In 1951 the Warsaw University of Technology incorporated the Wawelberg and Rotwand's School of Engineering. The Academic and Research Centre in Płock was created in 1967. In the year 1945 there were 2148 students at 6 faculties, and in 1999 there were 22000 people at 16 faculties. The Warsaw University of Technology granted over 104000 BSc and MSc engineer degrees between the years 1945-1998. Over the years, the University was an important scientific centre, educating academic staff not only for its own purposes, but also for other Polish schools of technology. Between 1945 and 1998 5500 PhD theses were written in all faculties. There were almost 1100 theses qualifying for assistant professorships. The number of academic staff grew significantly. In 1938, the University had 98 tenured professors and associate professors and 307 assistant professors and teaching assistants, whereas in 1948 there were 87 and 471, while in 1999 there were 371 professors, 1028 tutors, 512 lecturers and 341 teaching assistants. The traditions of patriotic upbringing of young people go back to the beginnings of the Warsaw University of Technology and the years in which it was born and re-born under various names. The university, called the Preparatory School for the Institute of Technology, was closed down for long years as a Russian reprisal for the November Insurrection, as many of its students had taken active part in the events. Only in 1898 was it possible to gain the permission for the opening of the Emperor Nicholas II University of Technology. In 1905 the school paid dearly for the protest of its students against Russian as the language of instruction and their backing for the right of the Polish nation the self-government. During World War I the school's equipment was taken to Russia. When, after long years of struggle, the Warsaw University of Technology was finally opened in 1915, the future seemed optimistic. However, it was not to be for long. On the 11th of November 1918, with the help of the University, Academic Legions were formed. Many students joined the army. They defended Lwów and fought in the Ossow fields. Many of them did not return to the University. In the time of the Polish-Bolshevik war the University was the seat of the General Headquarters. The memory of the University students and professors who fought in World War II and in the Warsaw Uprising is still vivid in our minds. They all sacrificed their blood and suffering within the University walls. The memory of their sacrifice is immortalised by the commemorative plaques and monuments in the University. The plaques in the Audience Hall in the Main Building remind us also about the freedom movements of the academic society in the years 1956-1957 and 1968. Many University Professors are not only model scientists, but also model patriots and moral authorities. The University's attachment to rules and values, the traditions of liberation manifestations of the students and academic staff constitute the foundation for the participation of the school in public life, whose presence reaches far beyond the school's academic, potential and scientific achievements. Heads of states, prime ministers, ministers and outstanding personalities of economic life often visit the University. The president of France, Jacques Chirac, visited the University on 12th September 1996. He was accompanied by the president of Republic of Poland Aleksander Kwaśniewski, who was also our guest during the Opening Ceremony of the Academic Year 1997. The Polish primate, cardinal Józef Glemp, has been visiting us for many years. In 1998 we received Ryszard Kaczorowski, the Polish President in Exile, who unveiled a plaque commemorating the events of the Polish October of 1956 and the youth protests in 1957. 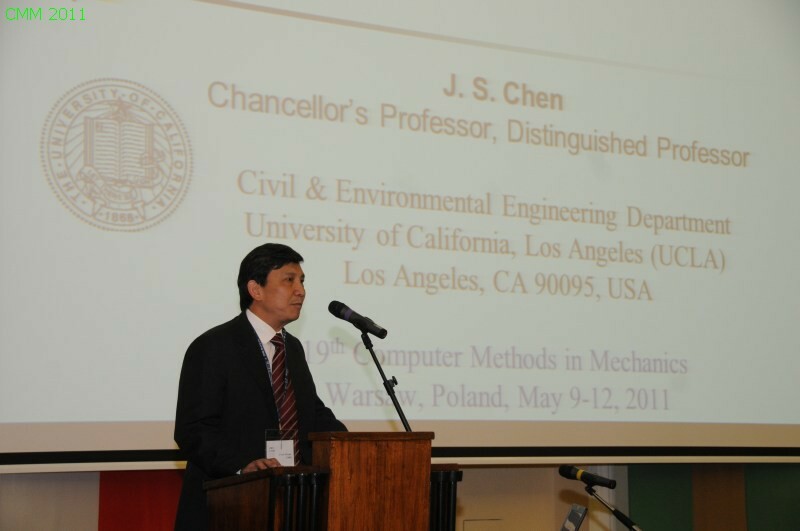 Warsaw University of Technology hosts large scientific congresses. From 21st to 24th September 1997 we organised the World Conference "Eurosensor XI", and in June 1999 the World Lighting Congress. The University organises important cultural events. One of them was the common session of Warsaw Universities in 1996 on the occasion of the 400th anniversary of Warsaw as the capital of Poland. Another was the Solemn Evening "Fides et ratio", devoted to Pope John Paul the Second's encyclical, under the honorary patronage of the Primate of Poland in 1998. More than one thousand people took part in each event. The historical Main Building is the symbol of Warsaw University of Technology. It was the venue of many important historical events: rallies, sessions, meetings and ceremonies. Here marches and demonstrations were organised. Today, the famous University Audience Hall is a representative place for Warsaw. Balls are held here in which the Prime Minister, the Marshalls of Parliament and Senate and many other eminent guests participate. The social, political, cultural and scientific elite meets every year at Carnival balls: the Alliance Ball and the Journalists' Ball. Our University has often entertained rectors of other schools from Poland or abroad. In June 1999 our University was the venue for the plenary session of the Conference of Rectors of Polish Academic Schools. Warsaw University of Technology has signed general agreements on cooperation not only with many leading universities from all over the world, but also with some large corporations like Siemens, Fiat, Daewoo, who have funded scholarships and prizes, and the University undertakes their approved research programmes. The University has also signed agreements that define our participation in the life of the city and region with the Masovian Voivode, the President of Warsaw and the Central Commune of Warsaw. Warsaw University of Technology is the school with the largest scale of operation of all Polish Universities measured in economic categories. In view of its social mission with proper care, the school has recently donated hundreds of thousands zlotys to many institutions, social groups and individual people affected by various calamities and disasters. Help was directed to the people affected by the flood in Poland in 1997, to the Szczecin Medical Academy after the tragic fire in 1998 and to the victims of the war in Kosovo in 1999. In December 1999 the city of Warsaw received a gift from the University: the illumination of the Copernicus Monument and Staszic Palace. The University has also funded the diploma performance of the Warsaw Theatre School in 2000.